The Mobile stations (MSs) must be registered at one of the MSCs for successful operation of numerous system functionalities. This is maintained not only for billing, but also for verification and authentication, as well as for access privileges. In addition to this permanent information, the wireless system needs to know whether the mobile station (MS) is currently located in its own home area or is visiting some other area. This allows for incoming calls to be routed to an appropriate location and assures desirable support for outgoing calls. This is done by exchanging signals known as "beacon signals" between the BS and the MS.
Base stations (BSs) periodically broadcast beacon signals to determine and test nearby MSs. Each mobile station listens for beacon signals, and if it hears from a new base station, it adds it to the active beacon kernel table. This information is then used by a MS to locate the nearest BS and establish an appropriate rapport to initiate dialogue with the outside world through the BS as a gateway. Some of the information carried by the beacon signals includes cellular network identifier, timestamp, gateway address, ID (identification) of the paging area (PA), and other parameters of the BS. MS listens for new beacons, and if it detects one, its adds it to the active beacon kernel table. If the device determines that it needs to communicate via a new BS, kernel modulation initiates the handoff process. The Mobile station locates the nearest BS via user-level processing. 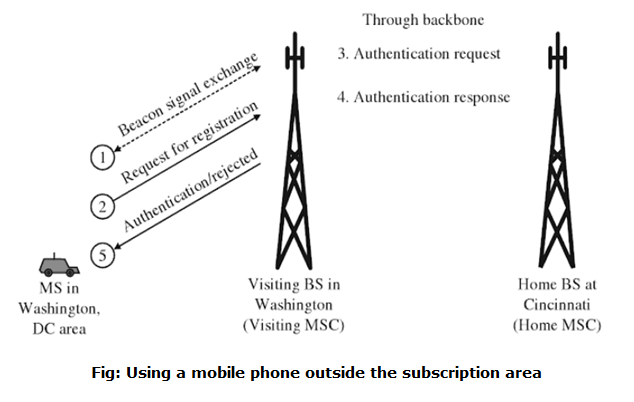 The visiting BS performs user-level processing and determines who the user (MS) is, the user's registered home site (MSC) for billing purposes, and what kind of access permission the user has. The home site sends an appropriate authentication response to the BS currently serving the user, which is stored in the corresponding VLR of the serving MSC (two-way pointers between HLR-VLR pairs). The Base station at the visited location approves or disapproves user access. 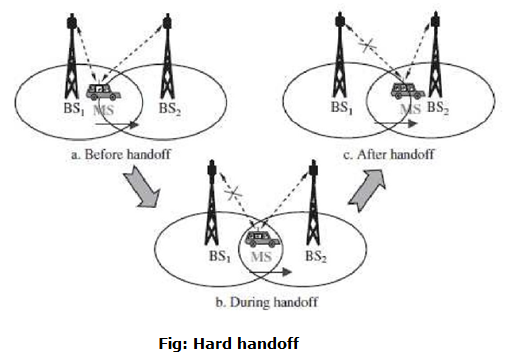 The process of transferring a mobile from one channel form one channel or base station to another is called handoff. When a mobile moves into a different cell while a conversation is in progress, the MSC automatically transfers the call is to a new channel belonging to the new base station. 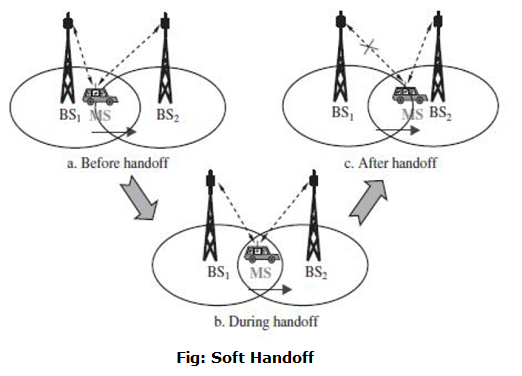 Handoff depends on cell size, boundary length, signal strength, fading, reflection and refraction of signals, and manmade noise. If the number of channels per area increases if the number of channels allocated per cell is increased or if the area of each cell is decreased. The base station monitors the signal level for a certain period of time before a handoff is initiated. The length of time needed to decide if a handoff is necessary depends on the speed of which the vehicle is moving. Number of calls transferred to the cell from neighboring cells by the handoff. Number of calls generated in the cell. Number and duration of calls terminated in the cell. Network management may cause handoff if there is a drastic imbalance of traffic over adjacent cells, and optimal balance of channels and other resources are required. Service related handoff is due to degradation of quality of services (QoS), and handoff could be invoked when such a situation is detected. Hard handoff, also known as "break before make" is one, in which the channel in the source cell is released only and after that the channel in the target cell is engaged. Thus the connection to the source is broken before the connection to the target cell is engaged. Thus the connection to the source is broken before the connection to the target is made for these reason such handover are also known as break before make. Both FDMA and TDMA employ hard handoff. Soft handoff "make before break" is one in which the channel in the source cell is oriented and used for a while in parallel with the channel in the target cell. In this case the connection to the target is established before the connection to the source is broken; hence this handover is called soft handoff. It is also possible to move from a cell controlled by one MSC area to a cell connected to another MSC.